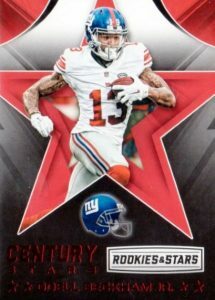 Just like last season, 2016 Panini Rookies and Stars Football seemingly popped up out of nowhere. 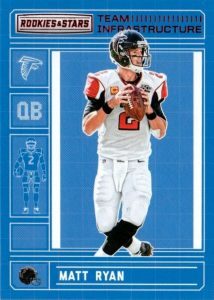 A consistent release for NFL collectors over the last few years, top options include Longevity inserts and the striking Crusade line. Once again, the set is exclusive to Target stores. The large, 300-card base set includes 150 veterans as well as 150 rookies spread across three different RC tiers: One Star, Two Star and Three Star. Multiple parallels build on this with Green (Fat/Retail packs), Purple (Hanger only), and Red (Blaster only). Exclusive to the Longevity box format are Longevity (#/75), True Blue (#/49), Gold (#/10), Platinum (1/1), and Printing Plate (1/1) parallels. 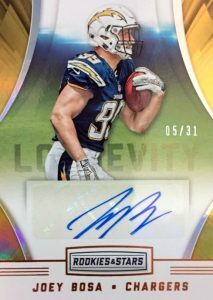 Featuring limited signed options, 2016 Panini Rookies and Stars Football includes Rookie Longevity Signatures (#/75 or less) and Great American Signatures (#/99 or less) with several numbered parallels. Dual Ink pairs two elite players with a print run of just ten copies. 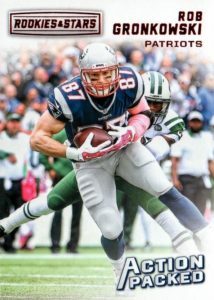 On the memorabilia side, Star Search, Cross Training (#/75), Freshman Orientation Autographs (#/49) and Dual Memorabilia (#/99) features 2016 rookies while Great American Treasures (#/49) showcases current and former NFL greats. Each relic also offers Prime (#/25 or less) and Premium/Laundry Tag (1/1) parallels. 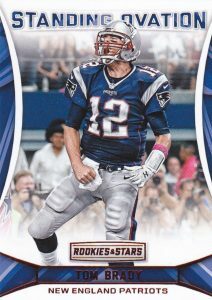 Finally, 2016 Panini Rookies and Stars Football is packed with inserts. 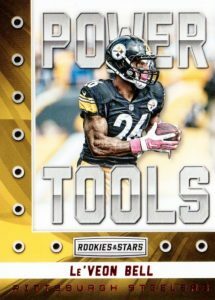 In addition to Crusade–which comes in Black, Gold, Green, Purple and Red–collectors can chase Action Packed, Century Stars, Great American Heroes, Power Tools, Standing Ovation, Team Infrastructure and Ticket Masters. 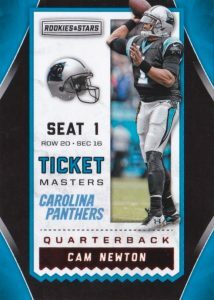 Also worth noting, there are the five different retail formats for 2016 Panini Rookies and Stars Football. These are covered below in greater detail. 300 cards. 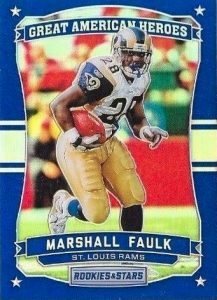 Shop for rookie cards on eBay. PARALLEL CARDS: Green, Purple, Red, Longevity #/75, True Blue #/49, Gold #/10, Platinum 1/1, Printing Plates 1/1. 90 cards. *Cards found only in parallels noted below. PARALLEL CARDS: True Blue #/49 (*Card #69 - #/47), Red #/25, Purple #/10, Gold #/5, Green #/3, Platinum 1/1. PARALLEL CARDS: True Blue #/49, Gold #/10, Platinum 1/1. PARALLEL CARDS: Prime #/10, Platinum 1/1. PARALLEL CARDS: Red #/99, Purple #/49, Gold #/25, Black 1/1. 30 cards. Serial Numbered #/49. PARALLEL CARDS: Prime #/10, Laundry Tag 1/1. PARALLEL CARDS: Prime #/25, Premium 1/1. PARALLEL CARDS: True Blue #/5, Platinum 1/1. PARALLEL CARDS: Red #/15 (*No cards #6, 10), Purple #/10 (*No cards #6, 10), Gold #/5, Green #/3, Black 1/1. 29 cards. Serial Numbered #/49. PARALLEL CARDS: Red #/99, Purple #/49, Gold #/25, Green #/5, Black 1/1. PARALLEL CARDS: Prime #/10 or less, Premium 1/1. 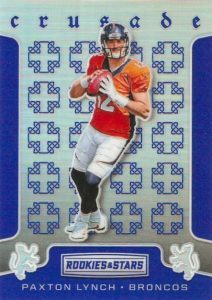 PARALLEL CARDS: True Blue #/25 or less, Platinum 1/1. 40 cards. Serial Numbered #/49. 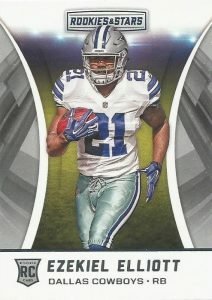 Shop for 2016 Panini Rookies and Stars Football packs and boxes on eBay. Why does Panini insist all their affordable products be crap? I understand the money is in the high priced wax, but make one good low end product to collect please. I will save a lot of money not buying this. only 7 total Detroit Lions inserts. What others are missing the point about with this affordable product is scarcity. Being exclusive to Target allows Joe average to collect hard to find autographs before Hobby shop owners scoop everything off the shelves and jack up the cost. 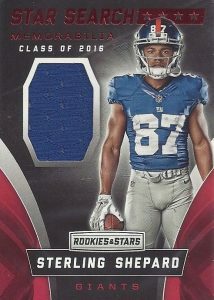 Several retail box purchases reveal highly drafted rookies however the overall variation of inserts excluding relics becomes excessively distracting form the base collection. One of my favorite products of 2016. With prices getting lowered, it’s worth it. Definitely recommend.